It’s true when they say that smiling more, even when you don’t feel like it, can make you feel better. In fact, research has shown that smiling decreases stress and lowers blood pressure. It even stimulates your antibodies, boosting your immune system. These facts and more from your cosmetic dentist may be what you need to get out of that funk you’ve been having. Along with aiding your overall health, smiling can boost your confidence and mood, so why not flash those pearly whites once in a while? You just might feel a positive difference afterward. According to a study from the European Journal of Social Psychology, smiling makes you more attractive to others you smile at. When they say that its contagious, it’s the truth! Another study conducted by the Orbit Complete determined that 69% of participants believed woman who were smiling were more attractive than those wearing make-up. Talk about a confidence boost! Furthermore, you’ll find that people tend to trust those who smile with more credibility than those who don’t. People may also consider you to be more approachable, so don’t be afraid to flash a smile the next time your out; it just might put you in a great mood. Sometimes if we find ourselves in an uncomfortable situation, our reaction is to smile at it, even if it’s not something we are particularly happy about. That’s because smiling can make you feel more comfortable in situations you may otherwise feel awkward in. The next time you feel the need to make yourself more comfortable, try smiling in the mirror (and check for random food debris too) to calm yourself down. Smiling has also been proven to reduce endorphins, the same chemicals your body emits while exercising. These chemicals help reduce stress and anxiety, balancing out your mood. According to a study conducted by the Smiling Hospital Research Team who visits hospitalized children, smiling can make the immune system stronger. This is caused by a higher production in white blood cells which fight illnesses. The team helped the children smile more by performing puppeteer shows and telling stories that made the children laugh. The children who experienced those activities recorded a higher white blood cell count than those who were not visited. 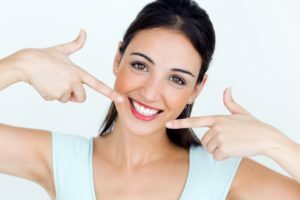 Let smiling improve your overall mood and confidence; your cosmetic dentist sure thinks it can help! Dr. Nelson Y. Howard, D.D.S., graduated from the UCLA School of Dentistry and completed a one-year General Practice Residency at the V.A. Medical Center in West Los Angeles, California. Thanks to clinical excellence, exceptional skill, and deep commitment, Dr. Howard was the 199th dentist in the world to earn Accreditation Status in the American Academy of Cosmetic Dentistry, the largest association of dentists specializing in cosmetic dentistry in the world. To learn more about his practice, contact him at (760) 599-6559 or visit his website.